I was 14 years old on April 1, 1999, when Nunavut was created. How little I knew back then. I admit I was mostly clueless. Even so, as a young Iqalummiut born to an Inuk mother and Portuguese father, in the process of discovering life and independence, I sensed the significance of this great achievement—the creation of Nunavut. I can proudly say that I am an alumna of Nunavut Sivuniksavut. Through my educational opportunity at NS, I learned so much more about the hopes and dreams of the many Inuit who were brave enough to stand up to the systems that oppressed us than I had being educated in Nunavut’s standard high school education system. In my view, the Nunavut high school system seemed to value European historical perspectives over Inuit knowledge and history. Just as it has done for many other Inuit youth before and after me, Nunavut Sivuniksavut re-instilled a sense of pride in who I was and where I came from. As time passes and I learn more and more about the hopes and dreams of our leaders, mostly articulated through a small handful of outspoken Inuit, the more I understand how significant the creation of Nunavut was—and hopefully still is—for Inuit. Because of that, I am more hopeful in my own personal efforts to advance our priorities through all my endeavours, using many different mechanisms, such as advocacy (talking about the issues) and personal action (doing something personally about the issues). For example, I have often felt inadequate in the level of my ability to speak Inuktitut, which is a direct result of how prominent English has become in Iqaluit. I talk about this often, but I have also taken action by taking the time to re-learn Inuktitut, increasing my capacity and my confidence when speaking Inuktitut. I realize that back then and even now, all we truly want and wanted was to protect our way of life—especially in the face of inevitable and constant change. I include the past tense “wanted” to recognize those Inuit who may have lost hope in the protection of our way of life. People must understand the context of the history we have endured. In looking at the Inuit Language Protection Act, Inuit should have confidence that our education system can provide Inuktut as a language of instruction from kindergarten to grade 12 by 2019. Yet, here we are, doubting Nunavut schools’ ability to deliver quality Inuktut-language instruction in 2019, even through kindergarten to grade 3. I myself have my irniq (son) who is currently in the Grade 1 Inuktut stream. Even as a Tumikuluit alumna (Inuktut-immersion early childhood learning centre in Iqaluit), I have questioned my decision to put him in the Inuktut stream in elementary school, given some of the feedback I have heard about Nunavut’s Inuktut-language instruction. This includes feedback from Inuit teachers who are required to produce Inuktut curriculum resources with minimal support from the Department of Education. These teachers are meant to lead the production of an Inuktut-language curriculum and resources for Nunavut schools. As a refresher, I gawked at the actions of the Department of Education’s decision to “phase out” much of the important and critical work of Inuit on embedding Inuit Qaujimajatuqangit (Inuit worldview and Inuktut) into our education system (see https://bit.ly/2BMnimA). I realize that many Inuit may have—or are on the verge of—losing hope in our government’s ability to protect our language and way of life. Our government leaders and bureaucrats are seemingly more preoccupied with a popularity contest that western governance systems have demonstrated and imposed upon us: a model of western governance that is led by a majority of senior non-Inuit bureaucrats and staff. As of Dec. 31, 2018, of the 20 senior management positions within the Department of Education, 16 were filled, and none (zero!) were occupied by Inuit. And yet some say that those who graduate from the Nunavut Teachers Education Program are not taking teaching positions because they accept higher-paying jobs within the government? Perhaps this disparity is most visible in Iqaluit, the capital of Nunavut, where the economy is viewed to be most profitable, where we see the majority of resources directed—over the objections of the majority population, Inuit and communities, who envisioned an equitable and prosperous territory with the creation of Nunavut in 1999. I won’t argue with those objections. How can I? The more I learn and personally experience, the more I realize how far we have drifted from Inuit hopes and dreams. Twenty years later, we are still struggling to protect our language, culture, education and the health of our people. Why is that? I think that is the question we all struggle with. Especially given the spirit and intent of the Nunavut Agreement. Especially given the resources and aspirations developed during Nunavut’s early years, including the “Bathurst Mandate,” a document that set out Nunavut’s priorities for the first five years of Nunavut’s life. Especially given the 2002 “Inuit Qaujimajatuqangit Task Force Report.” And especially given the 2006 “Nunavut Project” report written by Thomas Berger that articulated 13 years ago the crisis that Nunavut faced within Inuit education and employment. It’s a crisis I would argue that Nunavut Inuit continue to face today. Twenty years from now, I truly and deeply hope that we can say we have overcome the popularity contest of Nunavut politics, so that Inuit can believe we are on the verge of achieving or, better yet, have achieved, Inuit self-determination in governance, language and education supported by all levels of government for the sake of my own children, and all Inuit children. Tina DeCouto is from Iqaluit and is the mother of two boys. She is a Jane Glassco Northern Fellow and currently working for Nunavut Tunngavik Inc. as director for social and cultural development. All opinions expressed within are my own and do not represent the opinions of the organizations I am affiliated with, including The Gordon Foundation, Nunavut Tunngavik. Inc. and Tumikuluit. What an elementary and uninformative level analysis of “governance”. On the one hand politics has always been about some measure of consensus, dare I even say Inuit political systems, whatever they had historically been, would not have functioned well without this feature. The issue has always split on is who has the ear and influence over power, and who doesn’t. Either way, reducing modern politics to a contest for popularity alone (and this does happen to some extent) is not sufficient to understanding how these systems work. In Nunavut especially, which thankfully lacks party politics I would suggest this is even less pronounced. Good. The issue of language training might be a mystery to some people, and I don’t have an answer to it either, but I will suggest that in all things you can not legislate a vision into reality unless you have the expertise, infrastructure and the motivation to do so. I will grant you, that leaving it at that would probably not be suffice as well. Still, these are necessary conditions. As an Inuk Teacher, it pains me to see the lack of IQ being taught in the schools. There is so much to be taught about our amazing culture and language. I too find myself coming up with my own resources, but I am not complaining because the students are hungry to learn about who they are! They soak it all in. We need more INUIT teachers! More teachers who understand our society. MORE teachers who can relate to the students. As for the ‘Bosses’ in the education department, they too need to be filled with Inuit otherwise we will continue down the same road we are on. The better question is – How are WE planning to get there? I suppose that depends who is asking. Where are all the Inuktitut speaking teachers and RCMP and nurses, etc that are just waiting to be recruited? We should doubt the ability for schools to teach in Inuktitut, because there aren’t the people with the skills willing to do so! Keep in mind, we are not talking about teaching Inuktitut, we are talking about teaching IN Inuktitut. The people with the capacity to do this don’t stay teaching, and most don’t even stay in the Department of Ed. They find easier, sometimes higher paying, less stressful jobs elsewhere. Until there are a pile of Inuit wanting to be teachers in their own language, these goals won’t be met. Simply put, Inuit have to want to make it happen. Look to the MiKmaw in NS as an example – they have their own province wide education authority now, and are strong in their language…. because they went to university to take Education degrees, and went back home and were teachers. Until Inuit start taking BEd programs in mass numbers, the bilingual school system that holds students to as high educational standards as anywhere else in Canada won’t be possible. You cannot get people off the street to teach and then expect the system to produce graduates ready for university. End of story. It’s true, we need to stop taking short cuts in the name of a “made in Nunavut” solutions. The methods to get there are already in place. At times it seems the focus on re-invention is almost done out of spite. Either way, it’s not working. That can’t be the end of the story. For too long we have let that be the end of the story. The story has gone like this: we can’t get enough Inuit teachers, so we can’t build a strong school system with Inuit language and culture that develops and supports Inuit students’ identities, so we don’t produce enough graduates that can fill teacher education programs and so on. It is a broken circle. To say that is the end of the story is to give up on Nunavummiut because time will eventually run out on Inuktitut without change to the school system. Shut-down comments are like brakes, and we don’t need brakes right now, we need inspiration. We need to have a conversation about education, and let’s give people some space to have ideas. (I put my own ideas on language and culture in the education system out there in December, if anyone is interested, here: http://www.wakeimake.com/dear-ed/). It is a hard problem, but we can solve it, and the first step is to have some urgency, keep public debate going, and hopefully soon have a new chapter to this old story. The way to achieve total bilingualism is to have really intensive interaction in two (or more) languages from infancy. Intensiveness requires serious age-appropriate conversation and book-reading from the earliest age possible. My father and his two brothers were completely trilingual in English, Italian and French as a result of complete immersion from birth, initially in Italy. One brother became totally bilingual in German in addition and that was the language between him and his German wife. Another brother also married a German he met at university in Germany and they spoke German at home. This brother was later a diplomat in China for 10 years and there he became totally fluent in Mandarin. I know a family where the father in English and the mother Serbian. 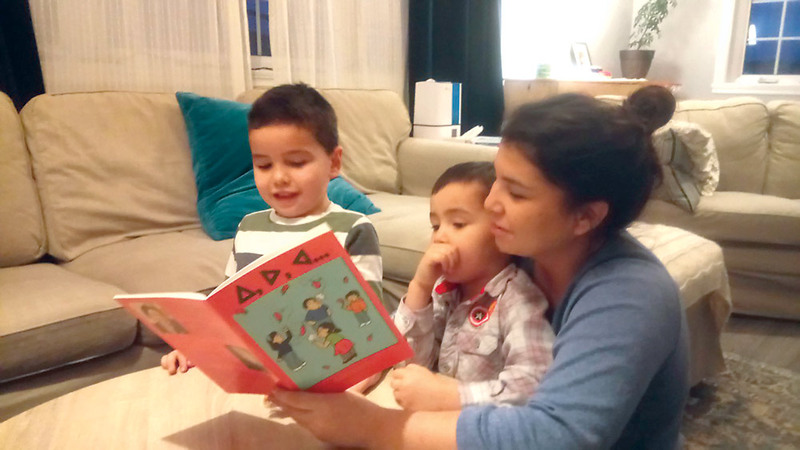 The father reads books in English to their children and the mother reads the same books translated into Serbocroat. The children are of course truly bilingual—as Justin Trudeau is in English and French.